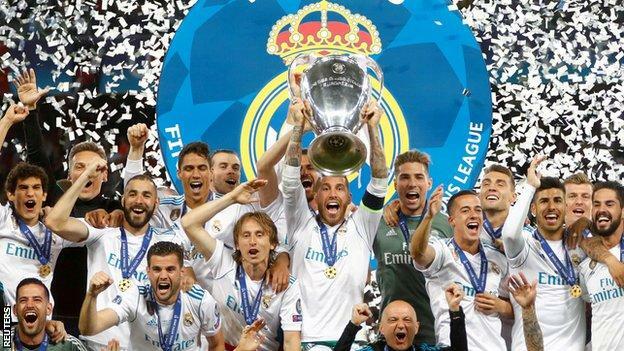 Real Madrid have won three Champions League finals in a rowFour English clubs will find out their Champions League group stage opponents when the draw takes place on Thursday.Manchester City will be in pot one, Manchester United and Tottenham Hotspur in pot two, while last season's runners-up Liverpool are in pot three.The draw takes place at the Grimaldi Forum in Monaco at 17:00 BST. Holders Real Madrid are in pot one with fellow Spaniards Atletico Madrid and Barcelona, as well as Bayern Munich, Juventus, PSG and Lokomotiv Moscow. When does the football start? The first Champions League group stage games take place on 18 and 19 September, with clubs playing the last of their six matches on 11 or 12 December.The knockout rounds begin in February, with the tournament concluding with the final at Atletico Madrid's Wanda Metropolitano on 1 June, 2019.